The Toronto Maple Leafs have a problem. They have too many good young forwards. Of these young forwards, a number have entry-level contracts that run out at the end of this season. New contracts must be negotiated. In addition, the team is fortunate to have signed a number of elite players – John Tavares and Auston Matthews specifically – to mega-contracts. Mitch Marner will become a restricted free agent at the end of this season and the Maple Leafs would be crazy not to re-sign him to another contract. He’s vital to the team’s success. The bigger question is the size of Marner’s contract when the Maple Leafs sign him. 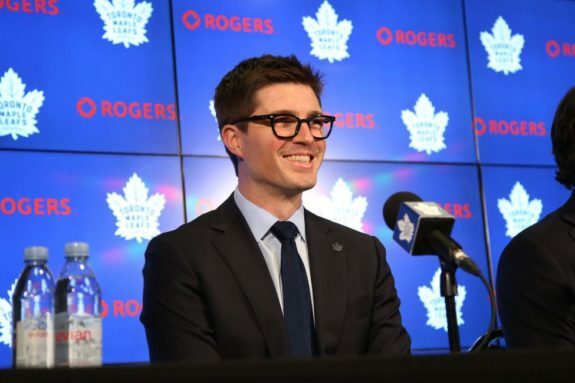 As many hockey pundits have pointed out, the result of the team’s current contracts and upcoming restricted free agents is that the Maple Leafs’ salary cap will be an issue next season regardless of any contract Marner’s agents and Maple Leaf general manager Kyle Dubas negotiate. It’s just a question of how big of an issue. In a pre-salary-cap world, the Maple Leafs would have had all the money they needed to sign all their players; they’re a rich team with a strong fanbase. But the team won’t be able to compress all its contracts under the top limit of the salary cap (estimated to be between $81.4 million and $85.4 million per team). As a result, the team must make choices about who will stay and who will go. They simply can’t sign all their best players to market-value contracts. Three Young Stars: Who to Keep? Specifically, I believe the Maple Leafs have three young stars they want to keep. 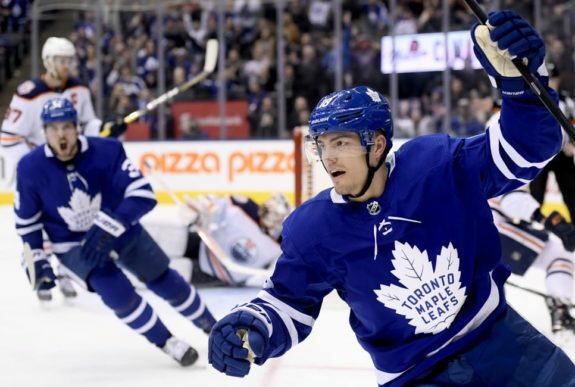 Andreas Johnsson is a 24-year-old Swede who played nine games with the Maple Leafs last season. 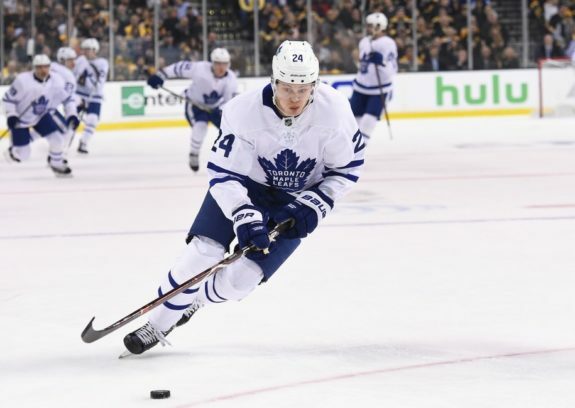 Kasperi Kapanen is a 22-year-old Finn in his fourth season with the team (he played nine games with the team in 2015-16 and eight games in 2016-17). And William Nylander is a 22-year-old Canadian/Swede (born in Calgary when his father played for the Calgary Flames). Like Kapanen, Nylander is in his fourth season with the team and is seen as a potentially elite player because he scored more than 20 goals as a 20-year-old and 21-year-old. Many Maple Leafs fans forget this is really Johnsson’s rookie season. He played a few games with the team last season, but was a known entity for several years because he played for the Toronto Marlies. Because the Marlies and Maple Leafs both practice in the same building, that closeness is an advantage for the Maple Leafs. Related – Maple Leafs’ Johnsson: Break out or Still Broken? Johnsson had an early-season hat trick, went through a growing period this season, and has emerged a regular contributor to the team. In 14 games in February, he had nine goals and five assists for 14 points (a point-a-game average). His current 20 goals, 22 assists, and 44 points in 68 games represent a significant contribution for a rookie. Personally, he’s grown on me more as the season has progressed. So much so that, if I were running the show, I would reject any notion of using him as trade bait to find help on defense. That option was presented by a number of hockey people prior to the trade deadline, but I’m thinking it’s closed now. Kapanen has had a breakout season. He’s been a steady scorer all season, both in and out of the top-six. Furthermore, he did an especially good job taking Nylander’s place during the holdout. Like Johnsson, he too has shown an ability to score. His 19 goals, 24 assists, and 43 points in 72 games also is a strong contribution for a 22-year-old player. Kapanen is also a good soldier. He does and says the right things, and he fits in anywhere the team needs him. He’s got good pedigree, as well. His father Sami Kapanen’s reputation is much different than Nylander’s father’s (Michael Nylander) reputation. Nylander was a restricted free agent last season and successfully held out for a larger contract, which he signed on Dec. 1, 2018, just prior to the deadline. Simply stated, of the three players noted here, I believe he’s the one who should be traded to accommodate the Maple Leafs’ long-range plans. Nylander slumped after he signed this season with the Maple Leafs; but his play recently has been stronger. He currently has five goals and 18 assists for 23 points in 47 games this season. Still, I don’t think he has that much more upside as a player than either Johnsson and Kapanen, and certainly not both. Related: Have Maple Leaf Fans Turned on Nylander? Nylander has his fans, and I have grown to appreciate him more as the season has progressed. I have no doubt he will be a strong player and, on one hand, I wish the team could keep him. That said, I believe Nylander embarrassed the team with an extended “me-first” holdout. I value Johnsson and Kapanen as team members more than I value Nylander. I also believe trading Nylander would be a statement Dubas should be willing to make to further establish his control over this team. Dubas isn’t cheap: he’s already shown himself willing to sign valued players to expensive contracts if they negotiate in good faith. From where I sit, he hasn’t squeezed anyone. I also like the message that anyone who wants to play in Toronto should become part of the team. And, I don’t mind if he trades someone to make that point. Other players will want to play with the Maple Leafs. If I were the general manager, I might see a Nylander trade as good for the team. Nylander’s contract presents a problem for the Maple Leafs because it takes up too much of their salary cap space. But it doesn’t represent a problem for other teams. 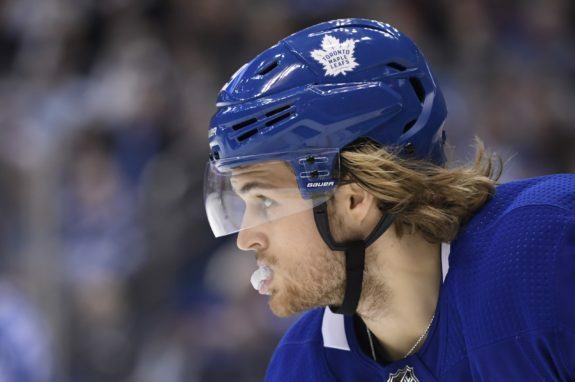 With top-end players getting around $10-million per season, Nylander’s contract soon might soon seem cap-friendly. I also believe another team might believe that, if he comes close to or exceeds current expectations, he could become a team’s star. Finally, I believe a Nylander trade would return good value. From what I have heard from Maple Leaf fans, I believe they would opt to see Nylander leave if it meant keeping Kapanen and Johnsson. When fans choose between these three players, I think Nylander comes in last. I don’t doubt Nylander is seen as a good teammate by other young Maple Leafs – especially Matthews, and that counts. However, he comes with baggage – his father. Nylander squeezed Dubas once and won, when will that happen again? The history of his father’s seeing the grass greener on the other side threatens to become an issue sooner or later. I’d dump it now. In short, there are three good young forwards. Given the salary cap space, I don’t think the Maple Leafs can sign them all. Dubas, who’s willing to act quickly, as he did with Matthews’ contract, should get deals done with Johnsson and Kapanen before July 1s. There’s a chance he can sign both Johnsson and Kapanen for Nylander’s $6.92-million cap hit. This solution isn’t perfect, but it helps address next season’s looming salary cap issues. Plus, it allows Dubas to show strength as he works to build the team he wants for the future.